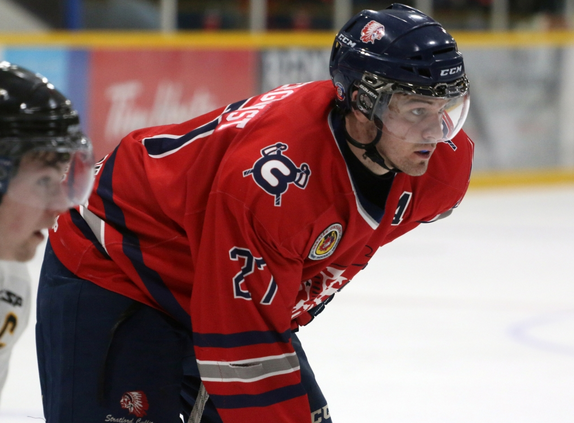 Mitch Vandergunst shown as a member of the Stratford Cullitons during the 2014-15 season. The CEO of the Ontario Hockey Association says the Stratford Hockey Club and their board of directors were very cooperative once they discovered one of their players was convicted on sexual assault charges last week. Scott Farley spoke on Stainton Home Hardware OHA This Week before CKNX’s Western Jr. C broadcast, discussing what Ontario’s hockey governing body will do regarding the case. This past week, former Culliton Mitch Vandergunst was sentenced to one year in prison after facing a sexual assault charge. The team, in a release sent out on Friday, said they did not know about the case until the 20-year-old Exeter native was convicted on January 30. The Junior B outfit also announced the resignation of Head Coach Phil Westman, who allegedly knew about the charges. Vandergunst was released on bail on Wednesday, pending an appeal. “We don’t want to lose sight here. We’re just talking hockey. In the big scheme of things, its just a game. And whatever happened, changed that person’s life forever.” Farley said. The case, which was under a publication ban, was based on two incidents that happened in 2013. Along with apologizing and announcing the departure of Westman, Vandergunst and forward Ty Bilcke, the club also announced they will be taking a number of steps to prevent this type of incident. You can find those steps here. To listen to the interview, checkout on the player below.